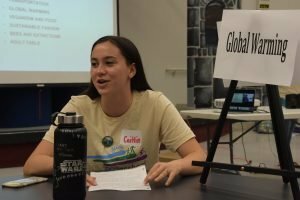 The Center for Climate Protection’s Youth Advisory Board (YAB) demonstrated their passion and commitment to climate action at the sixth annual Green Teen Conference, a youth-organized and youth-led climate conference. The motto of the conference this year was “Generation Us! Bring it Home” as student leaders made the connection between individual behavior and its impact on the planet. In a room brimming with anticipation and excitement, Solana Jolly, the master of ceremonies, extended a warm welcome to a room full of teens and community members. 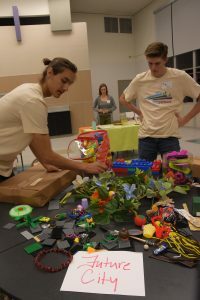 YAB is trying to model the sustainable behaviors they want to encourage in everyone. She proudly shared that Green Teen was designed to be a “nero-waste” or near-zero waste event, serving a vegan dinner to sixty plus participants. An accomplishment that few community events can proudly claim, thanks to the generous support our 2018 sponsors – Redwood Credit Union, and a host of volunteer cooks and servers. Ezra Berman and Annabelle Lampson set a strong intention of gratitude at the conference’s onset by guiding all the participants to stand up for a deep breathing exercise. “Our generation is under a lot of pressure as we are witnessing and feeling the very real effects of climate change”, said Ezra. Annabelle followed with, “It is equally important to acknowledge the interconnectedness of all life, feel gratitude for how nature sustains us, and use the power of gratitude to be eco-warriors and empower ourselves to push back, and counteract the pressure we are under.” Without missing an opportunity for a chuckle, they warned everyone from breathing out, lest we emit too much carbon dioxide! Building momentum, Celeste Palmer spoke to holding adults accountable both for what they have done and what they are not yet doing. “Praying that politicians will magically change their minds will not work, nor has it ever. What will work is to rise up and claim our voice and our future,” she said. She pointed to three solutions everyone could implement immediately –namely living sustainably as an individual, engaging with the community, and dreaming big. Lillian Lynch, from Windsor High School, ignited hearts with a powerful message. “We tend to believe that the most effective way to get a point across is to simply state the facts. However, we forget the passion and the emotional connection to this issue. True power comes from our hearts and minds working together.” she said. She shared her personal mission to create and distribute sustainability kits, and she is developing a series of house parties and events to distribute them to anyone interested in deepening their commitment to positive action around climate change. 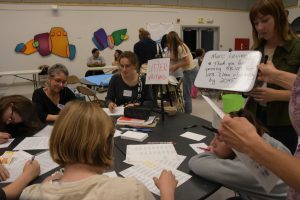 For the final activity, participants engaged in designing a future city, sharing personal stories of being a climate advocate, decorating re-usable water bottles, or writing postcards to their elected officials such as “stop fracking” messages to Gov. Jerry Brown and “thank you” notes to Assembly member Marc Levine for passing SB100. Maitreyi discovered in her teen years her passion for holistic education – finding purpose in life through connections to the natural world, our community and to values of compassion and peace. Born and raised in India, a Big Banyan Tree inspired her to pursue the liberal arts. She holds a B.A in Psychology and a Masters in Community Development from the Tata Institute of Social Sciences, Mumbai. 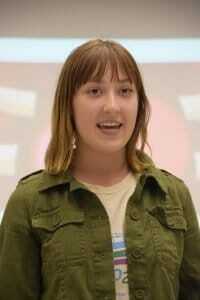 She is passionate about issues of social and environmental justice and sustainable development. She is a 2007 Fellow of the Leadership Institute of Ecology and the Economy in Santa Rosa. Having worked with ECO2school for three years in 2007, Maitreyi is delighted to return with the added perspective of being a mother of two, ages 7 and 5 yrs.